If it’s the second friday of the month you know where I’ll be: pedelating and picturetaking out and about through the night and among the hundreds of other Midnight Ridazzez. Hung out pre-ride with Mr. Roullier and along the way bumped into Eric Richardson and his fiancee Kathy , Jillian and L.A. Alternative’s Evan George, who I’d just seen last weekend when we did the cover shoot for the current issue of the newspaper. No sign of Sean Bonner or his bud Michael. Too bad, because they missed out on a sweet flat route down to the South Central Farm and back, where actress and farm advocate Darryl Hannah was out among the farmers cheering us on. Dedicated lady. At the end of the ride a jovial looking lad came up to me asking if I was “the wildbell.” After answering in the affirmative he told me he was Dave and had enjoyed reading my blog. When he saw the name didn’t register with me he said he’d left a few comments along the way, but it was only after he headed off in search of Silver Lake that I realized it was Dave. My apologies to him for being a tad flummoxed. I’m still getting used to this concept of people not only reading my deathless prose but also picking me out in a crowd. 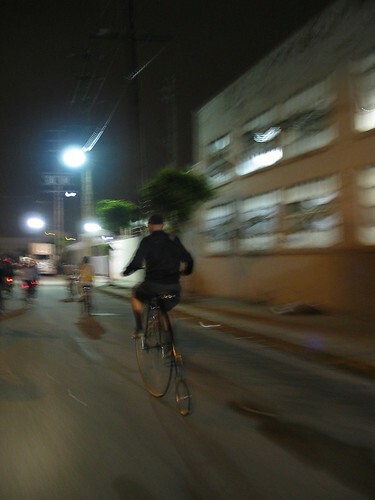 Anyway, pix of the Midnight Ridazz are here. This entry was posted on Saturday, June 10th, 2006 at 12:04 am and is filed under biking. You can follow any responses to this entry through the RSS 2.0 feed. Both comments and pings are currently closed.